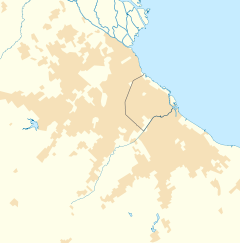 Villa Sarmiento is a locality in Morón Partido in the province of Buenos Aires, Argentina. It is home to 17,737 people and has an area of 2.55 km². With the foundation of the Fomento Villa Progreso society on 4 April 1909, the locality boomed and was taken into account by municipal authorities. In 1913, Ward School was founded, becoming a symbol of Villa Sarmiento for its impressive architecture and beautiful school grounds. This page was last edited on 8 September 2018, at 07:55 (UTC).